After more than a year and a half without a contract, Oakland teachers are preparing to vote on a strike. But teachers frustrated with how slowly the formal bargaining process works say they want to show the district they're willing to strike. So for the second time in two months some teachers plan to call in sick en masse Friday in what they’re calling a "sickout." Hayes listed grievances that ranged from the proliferation of charter schools in Oakland to the state of school facilities. He has helped organize the action and says he's heard from teachers at 10 schools who plan to take part, plus students and parents. 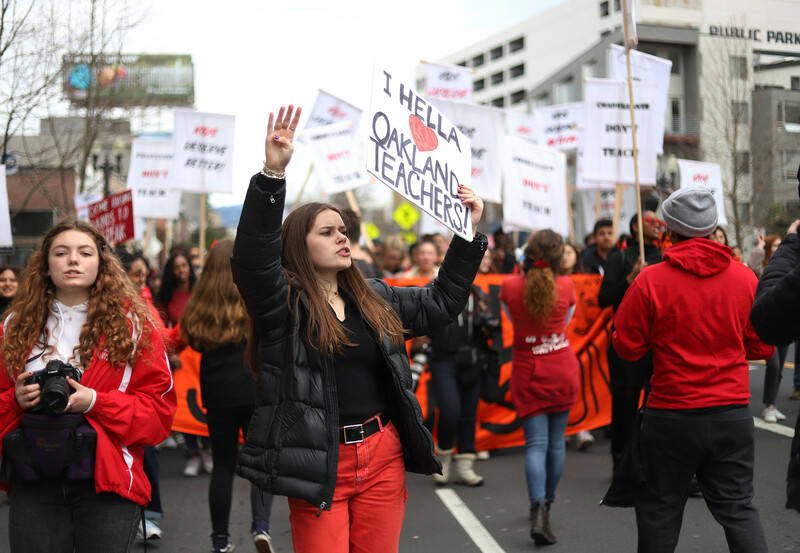 They plan to hold a rally in front of Oakland Technical High School from 8 a.m. to 9 a.m. and then march to the Oakland Unified School District office, where they plan to rally into the afternoon. In a letter to staff sent this week, district officials reminded teachers the action is illegal, writing: "Teachers participating in sick-outs will be subject to disciplinary action and will lose pay for time missed as these coordinated actions present significant safety and instructional problems for our students." Jenine Lindsey, the district’s director of labor strategy, said there’s a reason state law lays out a process for resolving labor disputes. The district anticipates schools will stay open and instruction will continue, with central office staff filling in. Some schools may run on modified schedules. This sickout, like the last, isn't sanctioned by the teachers union, the Oakland Education Association. "I understand the frustrations of our teachers," said OEA president Keith Brown. "Our teachers are willing to take action for the schools that Oakland students deserve." Friday's action comes after a rally last weekend that drew hundreds of teachers, parents and labor leaders to downtown Oakland to call for increased funding for education and to protest looming budget cuts and school closures. With Los Angeles teachers striking, six states have now seen educators stage walkouts to protest underfunding in the last year. It’s looking increasingly likely that Oakland will be the next battleground in the national debate about how we fund public education and pay teachers. As in L.A., Oakland's negotiations snagged on teacher pay and class size, among other things. The Oakland teachers union wants to see a 12 percent salary increase over three years, while the district’s final offer is a 5 percent increase over three years. "The pay is too low in Oakland, and the rent is very high," Brown said. "It is important that our teachers have a living wage so they're able to stay in the community and give our students the support they deserve." The average teacher salary in Oakland Unified is $63,149. That’s lower than all other districts in Alameda County, though that figure doesn't account for benefits. We want to hear from you. What stories should we cover? Oakland Unified's Lindsey argues that OUSD teachers don't see benefits deducted from their paychecks, while teachers in some other districts do. The showdown over pay and working conditions is playing out as budget cuts and school closures roil the district. 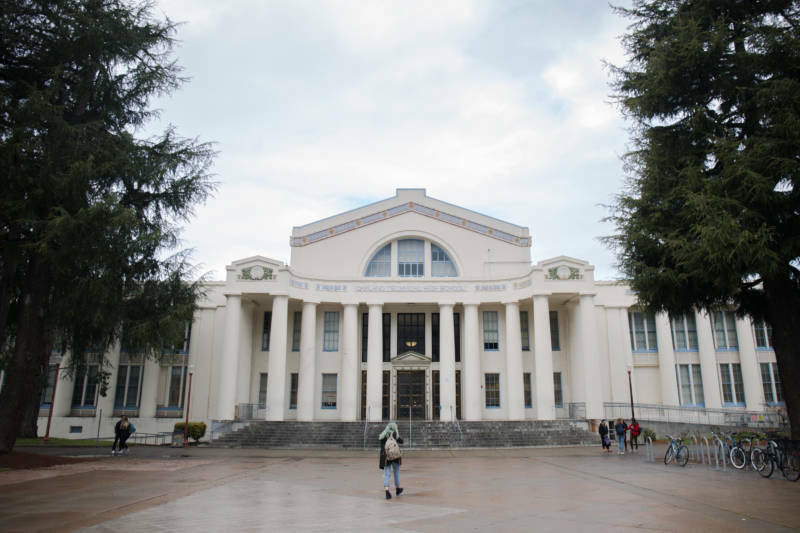 Oakland Unified is faced with tens of millions of dollars in cuts over the next three years, and the bailout money available from the state hinges on the district showing that it’s taking steps to become financially stable. Follow our coverage of the strikes, closures, and more. To that end, Oakland Unified is looking to cut millions of dollars from next year’s budget, while moving to close and merge schools. District officials estimate they need to cut down the district’s footprint by 24 schools. All this is aggravating the frustrations teachers already had about their working conditions. For their part, district officials say they want to pay teachers more. The district has identified boosting teacher pay and settling the contract as priorities for improving teacher retention and ultimately improving student outcomes. Given their budget constraints, it's a matter of coming up with the money. District officials say they’re looking for places to cut, but have not given specifics. The final step in the formal negotiation process is a fact-finding hearing set for Jan. 31 and Feb. 1. The union and district could reach an agreement during the hearing. If they don't, they expect a recommendation for a settlement from the fact-finding panel by mid-February. If the union rejects it, they can strike. Brown said he plans to announce the date of the strike vote this Sunday at an event to create posters and artwork for the possible walkout.